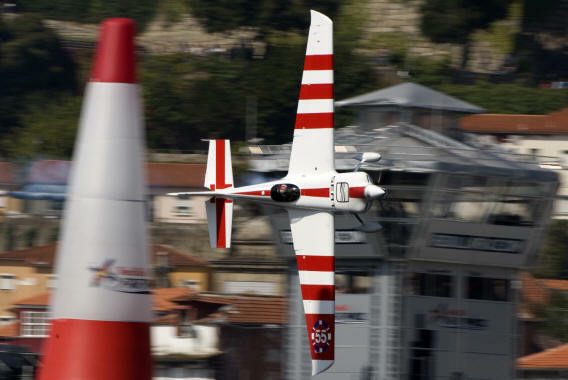 September 14, 2009, Porto, Portugal – Britain’s Paul Bonhomme won a thrilling Red Bull Air Race yesterday in front of a record-breaking crowd of 720,000 in Porto to widen his lead to 4 points over defending champion Hannes Arch of Austria. Australian rookie Matt Hall took a sensational 3rd place, the first podium of his career, and jumped from 5th to 3rd in the overall championship. Bonhomme stopped the clock in 1:09.23 on his final run through the 6.6-km course set up through 17 Air Gates on the Douro River under brilliant blue skies in the coastal Portuguese city to beat Arch by 0.94 seconds and Hall by 2.00 seconds. It was the second 2009 win for Bonhomme, who now has 55 championship points compared to 51 for Arch. Hall has 33 points and has overtaken both Nicolas Ivanoff of France and Mike Mangold of the United States on the strength of his stirring performance. Arch had been leading this year’s championship until the fourth round in Budapest, when the Austrian failed to get on the podium for the first time in over a year with a disappointing fourth place. Arch came to Porto looking to grab the lead back from Bonhomme. He stumbled in Qualifying on Saturday in front of a crowd of 200,000, finishing ninth after hitting a pylon and had to watch Bonhomme win an extra point awarded to the fastest Qualifier. But Arch bounced back in style on Sunday despite the intense pressure, putting in one brilliant run after another to advance to a Final 4 showdown against Bonhomme, Hall and Hungary’s Peter Besenyei. Porto was a disappointing race for Americans Kirby Chambliss and Michael Goulian. Chambliss was forced to retire with engine problems despite posting the fastest time of the day in the Top 12 placing him 8th. Goulian, who won the first race of his career in Budapest last time out, fell to 9th place. Mangold, the 2007 champion having a remarkably consistent year, salvaged some U.S. pride by taking 5th place, which leaves him 4th overall. Two other rookies had promising results in Porto. Matthias Dolderer of Germany took a solid sixth place and Japan’s Yoshi Muroya got 10th place after taking a career-high 4th in Qualifying on Saturday. The 2009 Red Bull Air Race World Champion will be decided at the season finale in Barcelona, Spain on October 3-4, 2009.